Two driverless shuttle-buses crashed in Rotterdam this morning causing a lot of damage. No passengers were inside at the time of the accident. 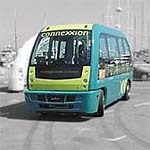 The completely automated Connexxion buses (see animation here) move commuters from metro station Kralingse Zoom to a nearby office park in Capelle aan de IJssel. 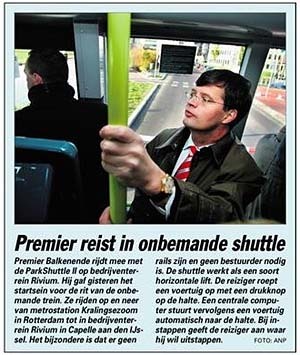 The accident comes only five days after prime minister Jan-Peter Balkenende opened the automated public transport system by riding it on Thursday last week. The two shuttles hit eachother on a one-way bridge where one should have waited for the other to pass. Until the cause of the accident has been resolved, the unmanned buses will remain grounded. This entry was posted on Tuesday, December 6th, 2005 at 8:28 pm CET and is filed under Life in Holland, News, Science & technology	with tags . You can follow any responses to this entry through the RSS 2.0 feed. You can leave a response, or trackback from your own site.